Welcome to the archive! Here you'll find a collection of authors who write both general and adult fiction for three amazing fandoms: THE MAGNIFICENT SEVEN, STARGATE ATLANTIS and CRIMINAL MINDS. There are also Mag7 galleries to ponder while you stroll through the site, so make yourself at home. If we can make your visit more enjoyable, or you would simply like to chat a spell, please don't hesitate to contact an author or your host! I would like to make special mention of the fabulous artwork I'm privileged to feature throughout the site. For example, my archive header is actually a photograph of an Oil Painting created by Amanda Lovett. The good news is Amanda's paintings are sprinkled throughout the site. The great news is that this artwork can be found at amandalovett.com with countless other beautiful paintings! LOST (OW) by ssinco. Written in answer to the 'Paramnesia' story challenge from the Gamblers and Gunfighters group on Facebook. Tempers flare as Judge Travis sends Chris and Ezra on a long and difficult mission. Trouble ensues not only for them but for Vin and JD, who come to their rescue. Can the seven stick together through frustration, confusion, injury, illness, and incarceration? DALLIANCE (ATF AU, Adult) by Sue M. JD gets to 'sow some wild oats.' We would like to welcome Sue M to the archive! A HEALING LOVE (ATF AU, Adult/SLASH) by Roxy and Jamie. Buck and Vin. After suffering a traumatic, physical attack, a true and healing love helps Vin to recovery. SABBATICAL (OW) by ssinco. What could possibly go wrong when Ezra, sporting a broken arm, and two of his also-healing associates, take a trip to San Francisco? Written in response to the Gamblers and Gunfighters Facebook 'Photo Inspiration' Fanfic Challenge. FRIEND (OW) by ssinco- An old friend of Buck's comes to Four Corners. What should be a fun visit leads to all to all sorts of trouble for the boys. THIEF (Alternative OW) by ssinco- Robberies around Four Corners lead to the discovery of an unexpected thief and more trouble than Chris, Ezra, Vin, Nathan, and Josiah ever expected. STORM IN THE MOUNTAINS (OW) by ssinco- Chris, Ezra, Vin, and Josiah go on the hunt of a murderous gang in the cold, harsh landscape of the Rocky Mountains. STORM TROUBLE (OW) by ssinco- A missing boy and a prisoner transport cause trouble for the Seven. IT'S A WONDERFUL LIFE (THE FIRM AU) by Winnie. Chris finds out what life would be like for the others had he never been born. CRIMINAL MINDS- ONE OF OUR OWN (Criminal Minds) by Winnie. Someone with a grudge against Rossi looks for revenge through Hotchner. WHERE THE HEART LIES (OW) by Jeanette Alice Ann. Ezra's past catches up with him but will he realise it too late? IN WITH THE NEW! The archive will be changing its appearance over the next few months but all links will remain active. I still have 30% of the site to switch over, so please try not to cringe when you get smacked in the face with the old format and colors! BABY TALES: THE SHOWER - by LaraMee. (Little Britches AU, ATF era) This is the first installment in a series focusing on the arrival of a new member of the “family” that includes the men of the Magnificent Seven. 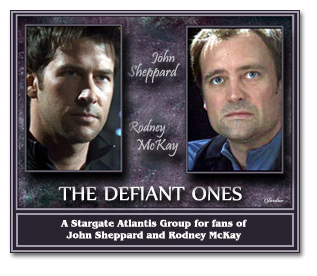 This story has been entered in THE SUSAN FULTON category of the GnG 2011 Fanfic Awards! WOLF-NAPPED - by Mystdogs. When Ezra defies his mother he may live to regret it. This story has been entered in THE GOLDEN TOOTH category of the GnG 2011 Fanfic Awards! Winner! NOT A GAME - by Kathy M. The Magnificent Seven, ATF. Sometimes things just happn. This story has been entered in THE SUSAN FULTON category of the GnG 2011 Fanfic Awards! Winner! NOBODY'S HOME - by Barb. This is the first entry into the AU Barb dubbed ‘Special Unit Seven’, which is a combination of Supernatural and an old show called Special Unit Two (although characters from that show are mentioned in here this will not be a crossover). This story has been entered in THE SILVER BUCKLE category of the GnG 2011 Fanfic Awards! JUST GET ME TO THE NEXT TOWN - by Jackie. The Magnificent Seven, OW. Judge Travis sends Chris Larabee and Ezra Standish to Denver to testify in court. FURTHERANCE - by Sarah. When Team Seven executes a raid on a moonshiner, things don't exactly go as planned. 2010 Ezzie Award Winner for Best ATF Gen Novella and the 2012 GNG BEADLE'S POCKET AWARD! 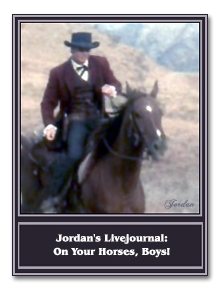 ON YOUR HORSES, BOYS!- by Jordan, The Magnificent Seven, OW. A rewrite of the ending of VENDETTA. The threat of "excruciating pain" becomes a reality for both Ezra and Chris! 2009 Ezzie Award Winner for OW Gen Novel. DON'T KNOW FROM ADAM- by Jordan, The Magnificent Seven, Old West (currently re-archiving.) Part 10 is up, only 1 more to go! For a complete list of titles, visit our Stories archive page. Please note the ADULT ARCHIVE on this site is linked separately and will require a one-time AGE Statement to be accessed. You must be 18 or older to enter. FANFIC CHALLENGES: Everyone is welcome to participate! Submissions should be sent to Jordan! Fanfic Challenge 'Magnificent Matchmaker'! This challenge was the braindchild of Marilyn Crawford after ogling a photo posted by Stacey Spencer in the Gamblers and Gunfighters group on Facebook. Write a story about what might happen if Buck were to decide to help all the guys with their love lives! You just know things will end in disaster! Any length, any AU! Gamblers and Gunfighters Facebook 'Photo Inspiration' Fanfic Challenge! "A picture is worth a thousand words," and that's one of the rules for this challenge. 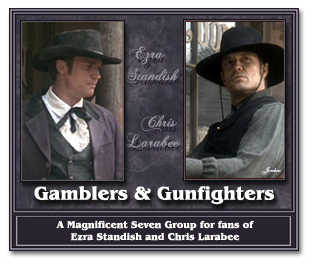 Using one or more of the amazing images shared by group members on the Facebook Group GAMBLERS AND GUNFIGHTERS, write a fic at least 1000 words long, featuring one or more of the Seven, using any fanfic universe as your platform. All submissions should include a copy of the image you've chosen as your inspiration. This challenge will be ongoing and may be submitted to Jordan for posting in the group and, if the author wishes, for permanent archiving on this site. Fanfic Challenge 'Paramnesia'! Using the definition of 'paramnesia' (Psychiatry. a distortion of memory in which fact and fantasy are confused; the inability to recall the correct meaning of a word), write a fic for the Mag7. Any length, any characters, any AU. Fanfic/Collage Challenge 'Silver and Gold' ! Using Ezra's gold tooth and the silver buckle on the back of Chris' pants as inspiration, write a story or create a collage about the two! This playground is wide open-- drama, humor, any AU, any length and any of the Seven! Fanfic Challenge 'Alone and Afraid'! Write a hurt/comfort story where one or more of the Seven are injured, but Nathan is unavailable to tend them. The mending/caregiving must come from the skills of the remaining lawmen. Any length, any AU! Author Sarah Bartholomew's new original novel, "Warrior of the Wastelands" is available now! Read it on Wattpad at 'Warrior of the Wastelands'. Feedback is not only welcome, but encouraged! Disclaimer: The stories archived here were created for entertainment purposes only.